I’m a tiny bit of a Wal-Mart celebrity. It’s eight years of working with our small-town church’s Vacation Bible School …plus eight-and-a-half years of being mom to young kids who have too many friends to fit the playdates into the schedule…plus years of singing songs with kids in our church’s Children’s Church…plus some children’s community theater work …and Voila: Wal-Mart Celebrity Status. Pushing my cart around the store, totally focused on comparing coupons with the 50+ options on the shelves, trying to keep up with the shopping list and the meal plan, I’ll still know it’s happening. Maybe it involves finger pointing or bashful waving. Occasionally, I’ll be just about tackled down in a football hug. My favorite is when they recognize me but they can’t remember why, so they are simultaneously trying to get my attention while looking a tiny bit confused, a lot shy, and maybe even socially panicked if I actually wave back. But this isn’t really fame, of course, not in the worldly sense of paparazzi, limos, mansions, TV commercials, bestsellers and autograph lines. This is just kids excited that you made a difference in their lives in the way only a rural, small-town church girl and momma can. Maybe it’s pride, the world, Satan, or just ugly sin, but something drives us so often to push and shove our way to the front row of this crowded planet. To be recognized. To be the best. To gain followers and have that spotlight track us around a stage. But the world is a crowded and noisy place with so many people clamoring and shouting in order to be heard over all the ruckus. Mostly our motives aren’t deep down evil. What we want, really and truly, is to make a difference for God. We want to be part of His ministry, be His hands, His feet, His voice. We want to do something “Great” for God, believing that God has called us to “Great” things and is going to give us a “Great” ministry. Yet, “Great” to God so often requires humble invisibility and sometimes painful but unrecognized giving. whoever wants to become great among you must be your servant, and whoever wants to be first must be slave of all. For even the Son of Man did not come to be served, but to serve, and to give his life as a ransom for many (Mark 10:43-45 NIV). “Great” means service, even slavery. It means self-sacrifice so extreme it’s life-demanding. What if “Great” means bringing up Godly children who serve the Lord into adulthood? Or building into a strong marriage that lasts and models Christ’s covenant love and faithful commitments to a world bruised and beaten by the lies of selfish passion and cheap vows? Or sticking with that tiny Sunday School class or small group year after faithful year? Or being content with Wal-Mart Celebrity Status or even less recognition than that? Impact. Aretha Franklin belted out a plea for R-E-S-P-E-C-T, but Impact is what I want. Not glory for me; just glory for Him. Not attention for me; just praise and honor for Him. And impact doesn’t start by reaching out to crowds and arenas and the world en masse. Impact begins with obedience right in our homes, churches and communities. If God takes us on beyond that, Amen. So be it. God’s will be done. If He doesn’t, still it is yes and Amen. His work began in his own home, not leading the Israelite army into battle against the Midianites. For I have chosen him, so that he will direct his children and his household after him to keep the way of the Lord by doing what is right and just (Genesis 18:19). 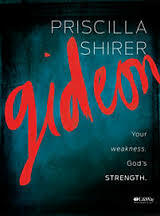 For Gideon, for Abraham…for us, that means focusing on the everyday, the invisible, the humbling, the self-sacrificing, the mundane, and the small and always, in all things, giving glory to Him. What lies ahead in your journey is not nearly as critical as where you are right now…your greatest impact will be done here—in the ordinary rhythms of your daily living (Gideon, p. 63). That is where impact begins. I don’t mean check it out I mean check and see that it’s not appropriate. Thank you so much for letting me know, Tina! I apologize! It used to be a devotional site, but I got a message from the manager who said she forgot to renew her site license in time and it was taken over by someone else. How very sad! Thank you so much. Have a wonderful summer. Blessings. Happy summer to you also!! If you love Priscilla Shirer’s studies, you will also love the new book and devotional studies written by her father and sister, Dr. Tony Evans and Chrystal Evans Hurst. They are called “Kingdom Woman: Embracing Your Purpose, Power and Possiblities.” Written to challenge women to look higher than where you are to whose you are. The book encourages women to set their eyes on Christ and to pursue what God has created them to be. Free devotional downloads, too! kingdomwomanbook.com.